Conan has won the throne of Aquilonia and the hand of the beautiful Zenobia. With a kingdom to rule and an heir on the way, will the Cimmerian finally hang up his sword for good? Dont bet on it. When his bride and country are attacked by a sinister Stygian sorcerer, Conan strikes back at Stygia with all his mightand the might of Aquiloniain a move that threatens to throw all Hyboria into chaos! 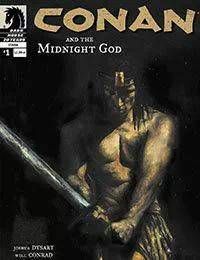 The long-awaited reunion of Violent Messiahs creators Joshua Dysart and Tone Rodriguez, Conan and the Midnight God #1 opens an exciting new chapter in the adventures of the barbarian king. Follow-up to Dysart and Rodriguezs story in Funcoms Age of Conan comic, distributed to 450,000 readers. Cover by Wizard cover-of-the-month artist Jason Shawn Alexander.